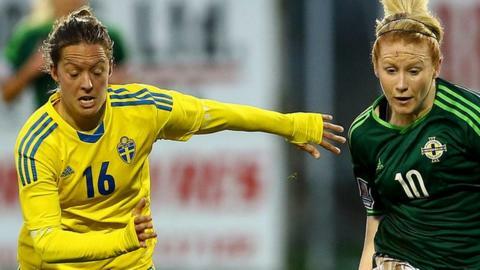 Northern Ireland found Sweden too strong in Thursday's World Cup qualifier played in Växjö. The Swedes, who like Scotland have a 100% record in Group Four, took the lead in the 12th minute through experienced midfielder Therese Sjögra. Caroline Seger made it 2-0 before half-time with Lina Nilsson completing the scoring on 74 minutes. The result leaves Northern Ireland with two points from their six matches in the qualifying campaign. They have had 0-0 draws with Bosnia and the Faroe Islands and defeats at the hands of Sweden, Scotland and Poland. Alfie Wylie's girls have four matches left and will be aiming to get a first goal when they travel to Bosnia on 14 June.